Le Puy en Velay appears to be the most ancient of the French lace centres dating back to the sixteenth century ; it was in connection with this factory that the Jesuit father, Samt Francois Regis, who is considered the patron saint of the lace-makers, earned his canonisation. Sumptuary edicts were published by the Seneschal of Le Puy which threatened to annihilate the lace trade, a heavy fine being imposed on any who wore lace upon their clothes. According to M. Lefebure “light and open guipure " was produced very early in the history of bobbin lace, but in the seventeenth century the staple manufacture seems to have been a rather coarse and inartistic thread lace, which was employed to trim household linen. > Although the industry was carried on a large scale throughout a big district it does not appear to have been uniformly prosperous, as there is evidence to show that in the first years of the eighteenth century there were many bitter com­plaints of bad trade and applications for the remission by the Government of export duty, from the lace-makers, who also asked for grants in aid of the unemployed workers. 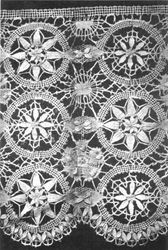 About 1760 the manufacture of Blonde lace was introduced with the result of a prompt improvement in trade, and from this time onwards the lace industry in Velay was a flourishing one ; a variety of laces silk, wool and thread, black, white, and colored have been produced in the district. 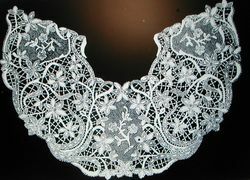 Cluny lace, which was recently very popular in England, originated in Le Puy. The name is purely fanciful, having been suggested by that of the well-known museum in Paris. 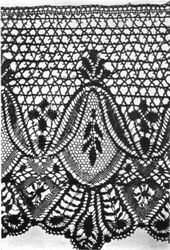 As in Italy, the art of lace-making was widespread in France, and as an inevitable consequence there are many laces which although bearing some resemblance to one or other of the distinct and well-known fabrics, differ in detail. These " odd" laces must always present a troublesome problem to the collector, although, fortunately for him perhaps, they were-never largely exported.